Josafine and I met almost 6 months ago. 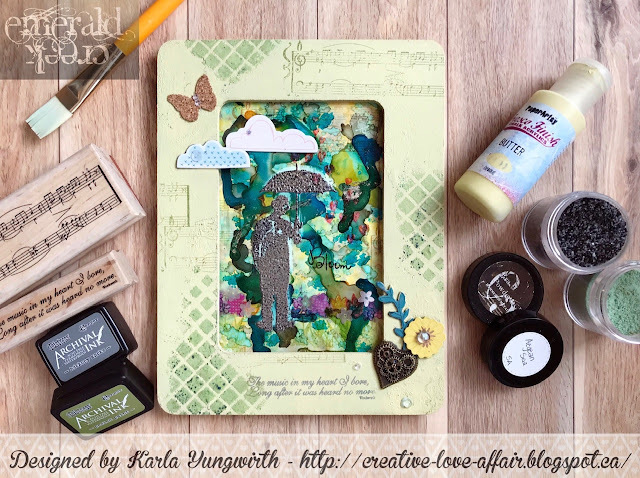 She did a wonderful project using Kelly Klapstein's Brush letter word stamps. Since then, Josafine has continued to create and occasionally integrate some EC products into her day to day, and I just LOVE her style. So I knew I had to have her back. Please welcome Josafine and enjoy her fantastic fantastic Father's Day project mini tutorial and video! I started by prepping my wood panel with regular white gesso and acrylic paints in green, blue and yellow. To add the texture, I blended Versamark ink through a stencil and used Charred Gold embossing powder for a shimmering effect at the bottom. Now I needed something in the upper right corner to balance the entire image, so I used the same stencil as before, blended Versamark ink through it and heat embossed it with Allure Fractured Ice embossing powder. After everything was dry and cooled down, I adhered a scrap piece of fabric to the bottom of the panel. This was a left over from one of my mono printing sessions and it fit perfectly with all the shades of green and blue. Next, I stamped the Golfer onto a gray tag, distressed the edges and popped it up with foam tape. A little bow completed the tag. Because I love the little gemstones so much, I had to add a few of them next to the tag. You can also watch the process in my video. This way you'll see how amazing the embossing powders are. I'm always in aaaw while melting them. And a big thanks to Kim for having me!!! This is such a beautiful and colourful project, I love the added gems - such a great finishing touch! Kim, I can't thank you enough for having me as a guest designer again! I truly enjoy creating with your gorgeous products and I'm so glad that I was able to share my project it with all of you! Cool project love how you included the tag. Also that pop of orange on my favorite color combo- need some!